Early in her literary career Nadezhda Lokhvitskaya, born in St. Petersburg in 1872, adopted the pen-name of Teffi, and it is as Teffi that she is remembered. In prerevolutionary Russia she was a literary star, known for her humorous satirical pieces; in the 1920s and 30s, she wrote some of her finest stories in exile in Paris, recalling her unforgettable encounters with Rasputin, and her hopeful visit at age thirteen to Tolstoy after reading War and Peace. In this selection of her best autobiographical stories, she covers a wide range of subjects, from family life to revolution and emigration, writers and writing. 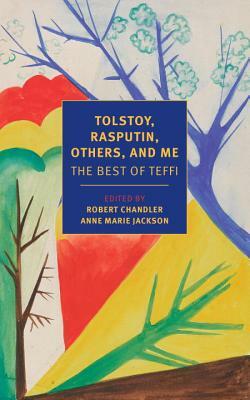 Like Nabokov, Platonov, and other great Russian prose writers, Teffi was a poet who turned to prose but continued to write with a poet’s sensitivity to tone and rhythm. Like Chekhov, she fuses wit, tragedy, and a remarkable capacity for observation; there are few human weaknesses she did not relate to with compassion and understanding. Teffi (1872–1952) was a popular writer in prerevolutionary Russia, a favorite of both Tsar Nicholas II and Lenin. She was born to a prominent St. Petersburg family and emigrated from Bolshevik Russia in 1919. Eventually settling in Paris, she became an important figure in the émigré literary scene and lived there until her death. Robert Chandler is the translator of the NYRB Classics editions of Andrey Platanov’s Soul and The Foundation Pit. His masterful translation of Vasily Grossman’s Life and Fate first appeared in 1985 and is available as an NYRB Classic. He lives in London.